China’s #MeToo movement changed its name to “Rice Bunny” avoid censorship. The new name comes from the words for rice and bunny, mi tu (米兔). The change circumvents China’s strict censorship laws, which have specifically targeted feminist movements in recent years. A Weibo discussion page for the movement – which has received over 2.2 million views – features the hashtag #ricebunny and icons of a rabbit and bowl of rice, which represent women’s fight against sexual misconduct in China. Chinese social media users have previously used similar homophones and images as a way to avoid government censorship in the past. 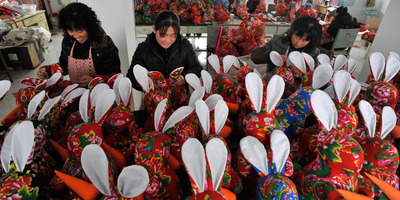 In 2012, “river crab” and “grass-mud horse” became popular on Chinese sites. The word for river crab sounds similar to the word for harmony, and was used ironically as slang for government censorship. Grass-mud horse, with a tone shift in Chinese, is actually used to represent vulgar words that would otherwise be censored. The rice bunny name has since become somewhat of a mascot for women in the conservative country, where sexual misconduct has long been a taboo subject and women’s movements, in particular, have been targeted by authorities. Additionally, last year Chinese censors temporarily banned Feminist Voices, a popular feminist organisation, for 30 days without warning. The founding editor of Feminist Voices, Lu Pin, recently told NPR that the ban served as a warning from the government as women’s voices grow louder. But the movement has recently made huge strides. Earlier this year, a Chinese university removed a prominent professor after investigating multiple allegations of sexual misconduct against him. The firing was seen as a major win for #MeToo in China and a served as a catalyst to encourage women to continue to come forward.